Designer tiles needn’t be restricted to bathrooms and shower rooms. Beautiful interior design is about finding the right aesthetic for every room, and designer tiling can be applied to a great variety of locations, from headboards to dividing walls, stairs to mantelpieces. This style of luxury interior design is perfect for new developments, as you are able to work with a blank canvas to create exactly the look you’re after. Designer tiles can elevate a new development into a unique and luxurious space that will entice clients to make themselves at home. 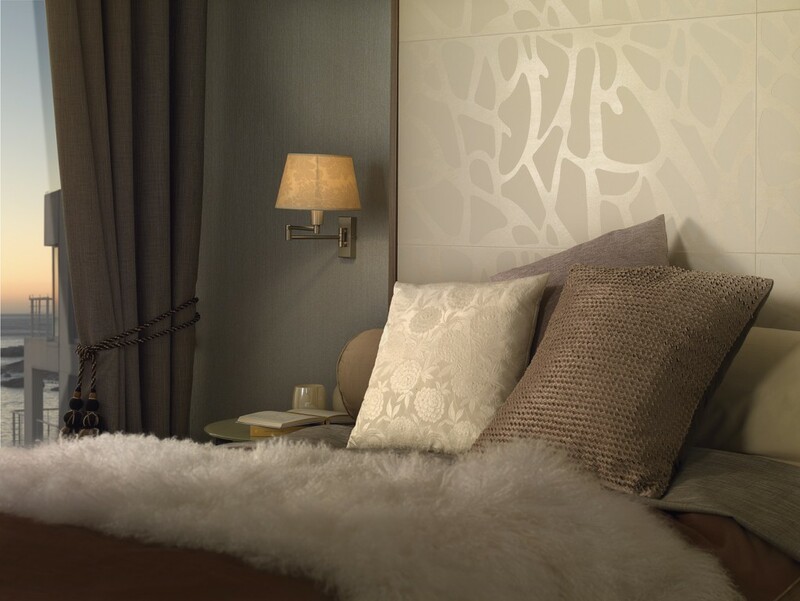 This stunning use of tiling creates a subtle textured headboard for a bespoke bedroom, making use of the reflective detail in the tiles to bring interest and light to an intimate space. Tiles can be used for bedrooms in many ways, including linking flooring into an en-suite or walk-in wardrobe, embellishing storage areas or providing a feature wall. 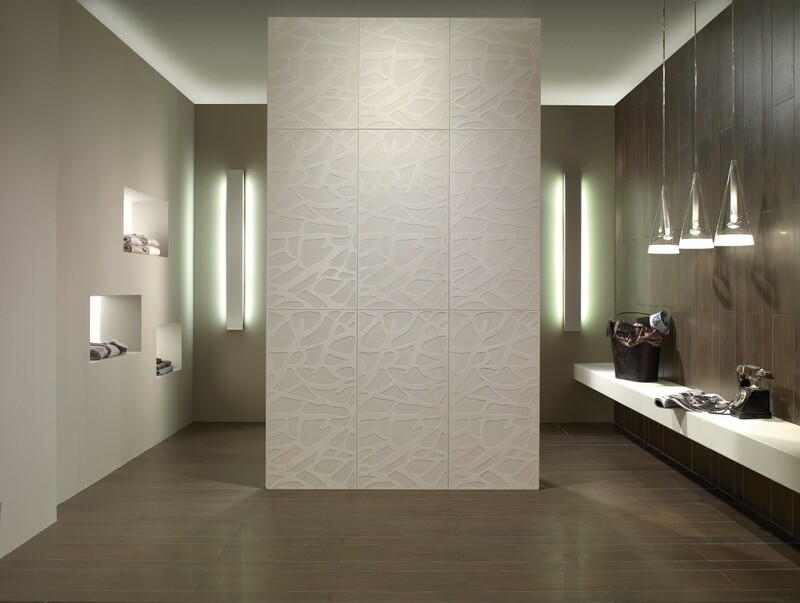 Designer tiles can be used to great effect in exclusive public spaces too, such as the chic spa changing room below. The designer tiling here has been used to highlight a dividing wall as well as giving interest to walls and providing a clean and functional floor. Intelligent lighting design has also been used to create an open and inviting atmosphere. This seamless look is so simple but is a fantastic example of effective use of designer tiling. For more information about using designer tiling for your new development, or for any aspect of luxury interior design, get in touch with us at Concept Virtual Design. This entry was posted in A3 Colour Design Service, Latest Tile Finishes, Luxury Bathrooms, Luxury Interior Design, Luxury Steam Rooms, New Products, Wardrobe and tagged bathroom design, bespoke bedroom design, designer tiling, exclusive interior design, luxury bathroom design, luxury tiling. Bookmark the permalink.